We had to postpone our plan of going to Jungfrau on this day because rains/clouds were forecast for that day on Jungfrau – however, Zermatt, another Alpine resort, was supposed to be sunny and so, we headed to Zermatt. Before we left for Zermatt, we had a hearty breakfast, which was, I must say, really good. Kudos to the hotel (Chalet Oberland, part of Best Western) for providing this as complementary in expensive Switzerland. The route to Zermatt was – to go to Brig (a pretty town actually) from where we had to take the last leg of the Glacier Express, which is run by the Matterhorn Bahn private railway. Once in Zermatt, we made our way to the Kline Matterhorn through a series of gondolas and cable cars. The views from there of the Matterhorn were spectacular – also, it showed the vast expanse of the Alps for the first time – needless to say, it was cold indeed. On our way back, we took another cable car to see the Schwarzsee Alpine Lake – but since it was getting late, we did not hike towards the lake. We took some snaps of the lake on the backdrop of the Matterhorn and then made our way back. 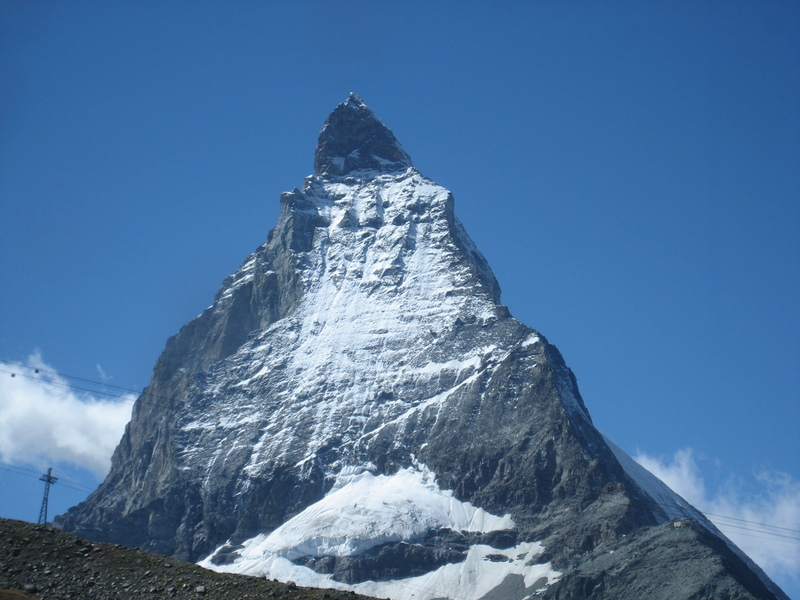 One thing that needs to be mentioned about Matterhorn is that no vehicles are allowed – it is a smoke free zone. The bus which took us from the lift station to the train station was an “electric” train. We reached Interlaken at 9:00 pm and then had dinner at an Indian restaurant very close to our hotel – Spice of India. The food was good and of course, it was expensive – but by now, I had stopped worrying about that – it was no point :-). Finally, I get the time to Blog about our Switzerland trip. Its been a month since we came back but I still can remember very clearly all the wonderful sights that I saw there. It was just a beautiful place – green, picturesque and clean. The people were very friendly and the trains ran absolutely on time. The Swiss people, apart from reveling on cheese and chocolates, take great pain in maintaining their country and the efforts are there to see. The place is really expensive and so, hence a Swiss vacation really does not come cheap. But then it is a price to pay to enjoy one of nature’s best kept beauty. We arrived at Zurich Airport on Sep 3rd at 7:30 am Zurich time after a 10 hour long flight from Dallas. The first thing that we did was to buy the Swiss Saver pass. One tip here – it is better to buy it online before you enter into Switzerland – we were charged 313 SF each. 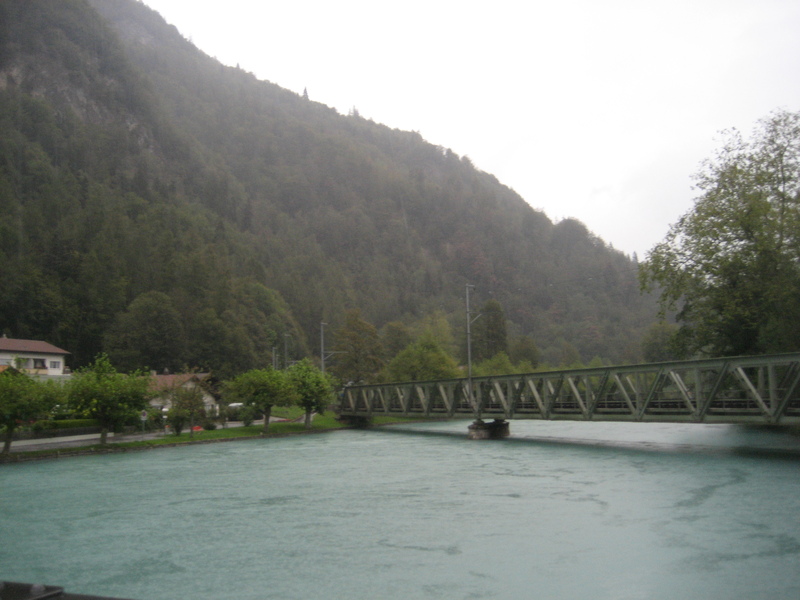 Our first train journey was from Zurich Airport to Interlaken – we reached Interlaken at 12 and it was good to find our hotel pretty close to the Interlaken West station. We were disappointed in the size of the room but we gradually got used to it. After freshening up, we went to an Indian restaurant, Gateway to India, for our first proper food in 24 hours. The food was not at all that great but the bill was – 50 SF. One thing that was getting clearer – Switzerland was not going to be a cheap place. After sleeping through the afternoon, we hit the road in the evening. It was raining a bit but that did not dampen our spirits to explore the place. We followed Rick Steve’s walking tour along the Aare river covering both Interlaken and Uterseen towns. Interlaken is indeed a small and very pretty place. We had dinner at a Pizzeria close to our hotel – the food was just great. We hit the bed early – we were planning to go to Jungfrau the next day. I had previously posted about how to hear Mahalaya in USA. However, it looks like many of the links in the Blog are not working. So, here is the latest link for listening to Mahalaya. Click on Part 1 and Part 2 to listen to the completely Mahalaya. Sanskriti – October 13rd and 14th at Foothill College, Los Altos. Prabasi – October 12th-14th at Chabot College, Hayward. Pashchimi – October 17th – October 21st at Sunnyvale, Temple.